Above: On April 3, 1978, after their five-month-4,200-mile-oceanic voyage, Thor Heyerdahl (center) and his 10-man crew burn their reed ship Tigris in protest of the wars raging in the Middle East. (Photo by Kon-Tiki Museum, Oslo). In 1995, the late Thor Heyerdahl, world-renown anthropologist and archaeologist, honored Azerbaijan International magazine by choosing us to be the first place where he documented his belief that Scandinavian ancestors came from the region now inhabited by Azerbaijanis. See "The Azerbaijan Connection: Challenging Euro-Centric Theories of Migration," Azerbaijan International 3.1 (Spring 1995). Search at AZER.com. Heyerdahl passed away last year on April 18, 2002. No doubt if he were here with us today, he would have something to say about the explosive situation that has developed in the exact region where one of his reed ship experiments originated - Iraq. Twenty-five years ago, on April 3, 1978, Thor Heyerdahl (1914­2002) was just completing a 4,200-mile voyage on a 60-foot reed ship known as the Tigris. His journey had started at the place many consider to be the birth of civilization - the verdant valley between the Euphrates and Tigris rivers in Iraq. Setting sail from the banks of the Tigris, Thor and his crew navigated down the Persian Gulf to Oman and eastward to the Indus Delta of Pakistan. Then they reversed direction and headed southwest back across the Indian Ocean in the direction of the Horn of Africa. 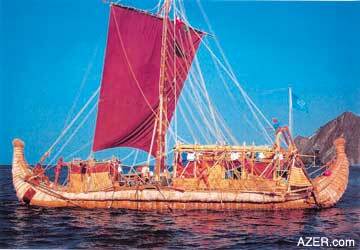 It was the last of Thor's four trans-oceanic voyages, the first being the well-known 1949 Kon-Tiki voyage made on a balsawood raft from the coast of Peru to the Polynesian Islands. The Tigris' crew comprised 11 multinational members: Thor Heyerdahl (Norway), navigator Norman Baker (USA), art student and interpreter Rashad Nazi Salim (Iraq), underwater cameraman Toru Suzuki (Japan), professional photographer Norris Brock (USA), young navy captain Detlef Zoltzek (Germany), physician Yuri Senkevitch (USSR), mountain climber and expert with ropes Carlo Mauri (Italy), amateur archaeologist Ghermán Carrasco (Mexico) and students Hans Petter Bohn (Norway) and Asbjørn Damhus (Denmark). After surviving the treacherous five-month journey at sea, Thor had wanted to end his voyage in the port of Mitsiwa (now Massawa) on the western (African) side of the Red Sea. It was through this port that he had originally brought the reeds from Lake Tana in Ethiopia for the building of two earlier experimental ships, Ra I and Ra II. But Ethiopia was involved with a breakaway war with the Eritreans. Nearby Somalia was at war, too. 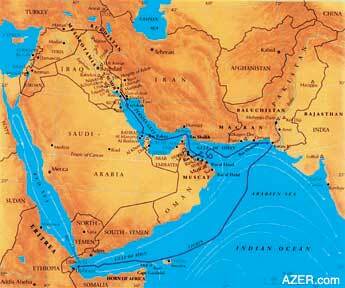 On the opposite side of the Gulf of Aden, civil war had erupted in Yemen. Thor and his crew decided to try to steer in the middle of the Gulf between Yemen and Somalia. However, when the winds died down, navigating the primitive reed craft became extremely difficult and they began drifting towards the island of Socotra, which belonged to South Yemen and on which the Soviets were installing military hardware at that time. Eventually, they had no choice but to land in the newly established African nation of Djibouti, a small neutral country squeezed in between Somalia and Ethiopia. They had survived on sea, only to be denied a place to land because the entire region was engulfed in war. In the end, Heyerdahl decided to torch the Tigris, setting it ablaze as a bonfire for peace, protesting the wars that were raging, fueled by arms sales by the major Western powers, including the Soviet Union. The crew members stood on the coral reef in silent awe at the ironic fate of the Tigris, watching the hoisted sails flare up like a torch as the red sunset disappeared behind the dark African mountains. Burning the Tigris was a difficult decision for Thor, but it was also his way of not letting the ship rot amidst the warships and man-made pollution found in the harbor off Djibouti. Also it meant that no one would be able to exploit the ship for their own commercial benefit. Saddam Hussein, too, had been eager to use the reed ship for his own public relations purposes, as it had originally been assembled in Iraq. Heyerdahl's earlier vessels, the Kon-Tiki (made of balsa logs) and Ra II (made of reed), are both on exhibition at the Kon Tiki Museum in Norway. Heyerdahl's experiment, like his previous voyages, again proved that early man could have successfully navigated immense distances across seas and oceans thousands of years ago. The Tigris, constructed of buoyant river reeds, had been a fine sea-worthy vessel. On April 3, 1978, Heyerdahl wrote the following Open Letter to Secretary-General Kurt Waldheim of the United Nations to explain why he had burned his ship as a desperate plea for world cooperation. His call for sanity is as relevant today as it was 25 years ago. Heyerdahl sent the following Open Letter to Secretary General Waldheim from the Republic of Djibouti, Africa on April 3, 1978. As the multinational crew of the experimental reed ship Tigris brings the test voyage to its conclusion today, we are grateful to the Secretary-General for the permission to have sailed under United Nations' flag, and we are proud to report that the double objectives of the expedition [of succeeding on a transoceanic voyage with a primitive craft manned by an international crew] have been achieved to our complete satisfaction. Ours has been a voyage into the past to study the qualities of a prehistoric type of vessel built upon ancient Sumerian principles. But it has also been a voyage into the future to demonstrate that no space is too restricted for peaceful coexistence of men who work for common survival. We are 11 men from countries governed by different political systems. We have sailed together on a small raft-ship of tender reeds and rope a distance of over 6,000 km [4,200 miles] from the Republic of Iraq by way of the Emirates of Bahrain, the Sultanate of Oman and the Republic of Pakistan to the newly-born African nation of Djibouti. We are able to report that in spite of different political views, we have lived and struggled together in perfect understanding and friendship, shoulder to shoulder in cramped quarters through calm and storms, always according to the ideals of the United Nations: cooperation for joint survival. When we embarked last November on our reed-ship Tigris, we knew we would sink or survive together, and this knowledge united us in friendship. When we now, in April, disperse to our respective homelands, we sincerely respect and feel sympathy for each other's nations. Our joint message is not directed to any one country but to modern man everywhere. We have shown that the ancient people in Mesopotamia, the Indus Valley and Egypt could have built man's earliest civilizations through the benefit of mutual contact with the primitive vessels at their disposal 5,000 years ago. Culture arose through intelligent and profitable exchange of thoughts and products. 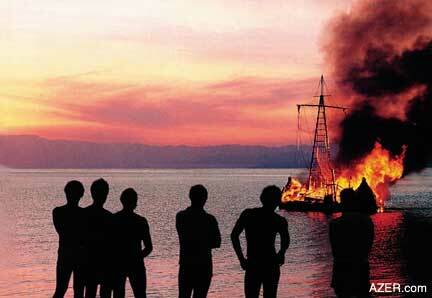 Today we burn our proud ship, though the sails and rigging are still up and the vessel is in perfect shape, to protest against inhuman elements in the world of 1978 to which we have come back as we reach land after sailing the open seas. Now we are forced to stop at the entrance to the Red Sea. Surrounded by military airplanes and warships from the world's most civilized and developed nations, we have been denied permission by friendly governments, for reasons of security, to land anywhere, but in the tiny, and still neutral, Republic of Djibouti. Elsewhere around us, brothers and neighbors are engaged in homicide with means made available to them by those who lead humanity on our joint road into the third millennium. To the innocent masses in all industrialized countries, we direct our appeal. We must wake up to the insane reality of our time, which to all of us has been reduced to mere unpleasant headlines in the news. We are all irresponsible, unless we demand from the responsible decision makers that modern armaments must no longer be made available to people whose former battle axes and swords our ancestors condemned.